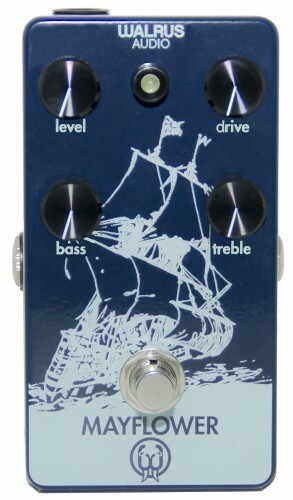 The Walrus Mayflower is a true bypass, midrange overdrive pedal that falls in-between the Voyager’s low gain preamp settings and the Iron Horse’s full and harmonically rich distortion. The Mayflower boasts a transparent, midrange signal that is great for cutting through or adding to the rhythm. It includes Level, Drive, Bass and Treble controls for a large range of tonal versatility. The Mayflower provides a transparent and organic sounding breakup that allows tweaking and shaping to boost your original tone.